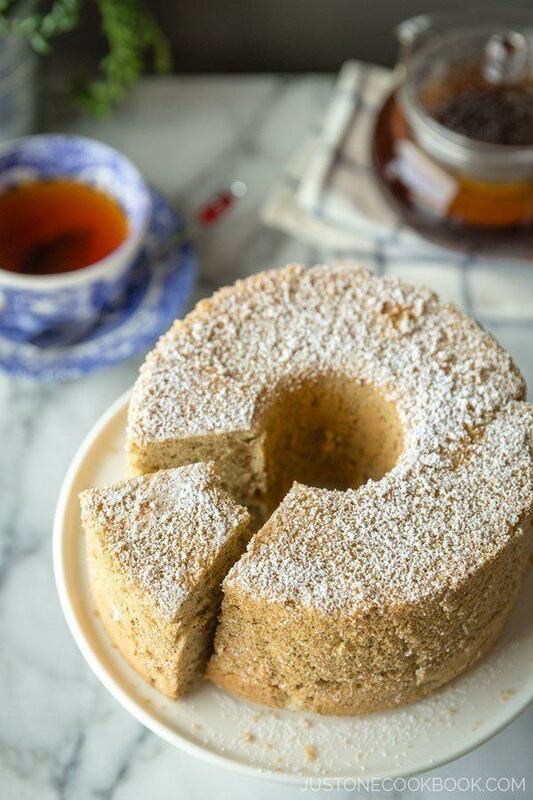 Light and airy chiffon cakes are one of my favorite desserts to make. Baking a chiffon cake may seem daunting to some, but it’s totally worth it once you master the basics of this favorite Japanese pastry. 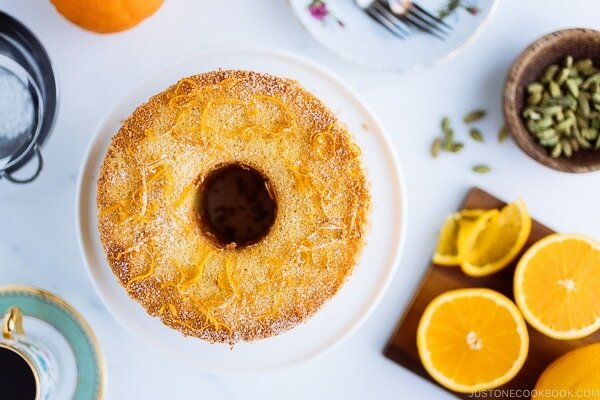 Here are some tips and techniques for making the perfect chiffon cake. Troubleshooting included! It is pronounced as SHE-fon cake. Made with simple ingredients such as oil, eggs, sugar, flour, and flavorings, a chiffon cake is a light cake with spongy texture. 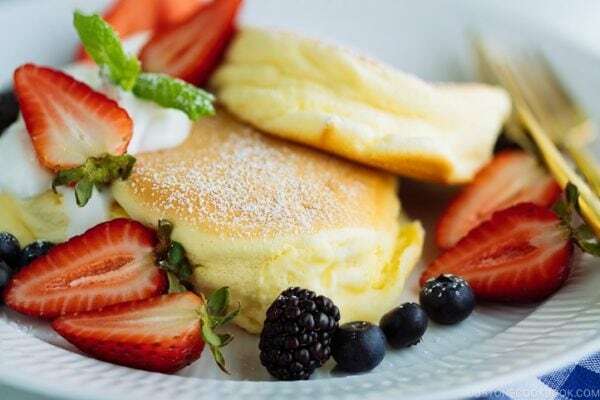 Unlike other types of sponge cakes that use chemical/artificial leavener such as baking soda and baking powder, chiffon cakes are leavened mostly from the meringue (stiffly beaten egg whites). They are baked in a tall pan with at least four inches deep and must be cooled upside down to retain their height. Is Chiffon Cake The Same as Angel Food Cake? You might be more familiar with Angel Food Cake as they are commonly sold in grocery stores. The only difference between these two cakes is that Angel Food Cake uses no egg yolks and no fat, but chiffon cake includes them. What Makes a Perfect Chiffon Cake and How to Achieve It? It rises tall and straight to the top of the chiffon cake pan without caving into itself. The texture of the sponge is light, fine, airy, fluffy, and bouncy. The sponge is very moist, and usually not overly sweet (especially if you are making a Japanese chiffon cake recipe). 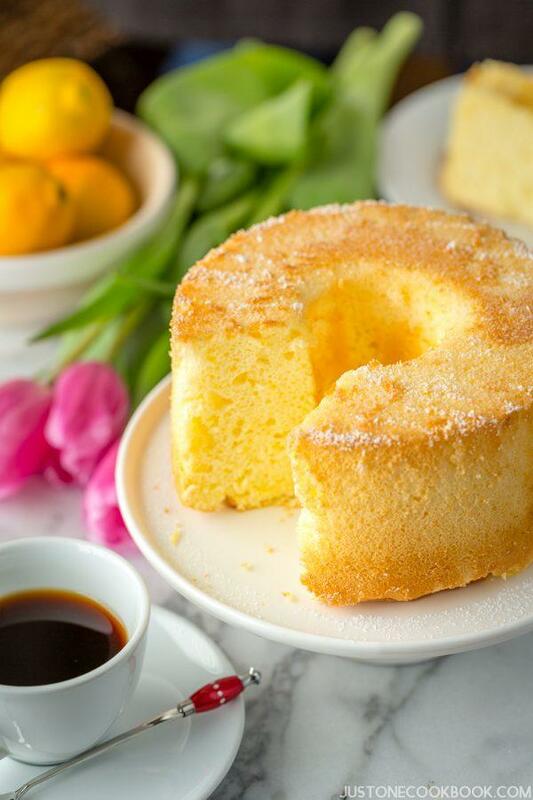 In order to make a perfect chiffon cake, there are a few important factors. So let’s go over them. This is the most important factor, so I’ll cover this topic in a separate section below. 2. Use the right chiffon cake pan. Make sure you use the right chiffon cake pan. The best types are the aluminum pan with a removable base. Make sure the pan is NOT non-stick. Do not grease the mold because the cake needs to cling to the sides and center of the pan for support as it rises. Otherwise, it will collapse. You can buy a 7-inch round angel cake pan with removable base on Amazon or a 17-cm aluminum Japanese chiffon cake pan on Nihon Ichiban or Amazon. 3. Let cool upside down. The cake must be cooled upside down in its pan so that it stretches downward instead of collapsing. Stick the cake pan on a tall heavy bottle and let cool for 3-4 hours before removing the cake pan. If you use an angel food cake pan, invert the cake pan on a cooling rack. The key to the successful chiffon cake is the meringue – beaten egg whites. There is no clear and easy way to show how much beating is enough, except for your own trials and errors. I could only give you a few tips that may help you succeed. I know, it’s a total opposite of what you learned in American recipes. I’ve seen most of the American recipes use room temperature egg whites to make meringue. However, almost all (99%) Japanese chiffon cake recipes require cold, well-refrigerated, or sometimes half-frozen egg whites, to make meringue without cream of tartar. Chilled egg whites will make very fine and smooth meringue with small and strong air bubbles inside. They remain strong even in the oven, and help the batter rise higher and fluffier. If you are not from the US, which method do you use? There is always discussion on how much you should beat the egg whites. From my experience, it’s best to stop when you lift the whisk, the egg whites go straight up (stiff peak) and just the tip is soft enough that it folds over, like taking a bow. Then switch from the hand-held electric mixer (or stand mixer) to a balloon whisk, and thoroughly mix the sides and center of egg whites a few times to get to the same consistency throughout. I used to use a silicone spatula to fold beaten egg whites into the egg yolk mixture so that you won’t deflate the egg whites, which would result in a dry and dense cake. However, I have read several instructions and youtube videos that a balloon whisk is actually a better choice to incorporate egg whites into the batter. After a few trials, I am convinced that the whisk is the best way to fold in egg whites. When you fold in egg whites, you might be afraid of breaking the air bubbles and may not mix the batter thoroughly. I felt the same way and always thought I mixed enough. However, when the egg whites are not mixed in with the mixture thoroughly, they would end up separated in the oven. As a result, it creates big air pockets/holes inside the batter while being baked. Fold carefully and slowly so you would not deflate the egg whites. 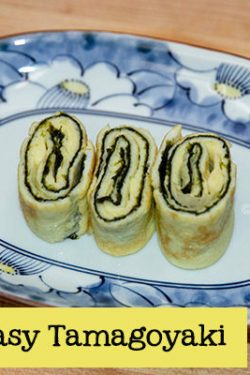 Fold in one-third of the egg whites first to lighten the batter, and then fold in another 1/3. Then transfer the mixed batter into the egg whites to fold the rest of egg whites. Since 17-cm chiffon cake pan is the most common size for chiffon cakes in Japan, I usually bake with a 17-cm Japanese chiffon cake pan. It’s a decent-size cake for Japanese standard, but it looks “tiny” next to typical American cakes. *All my chiffon cake recipes on Just One Cookbook use a 17-cm chiffon cake pan. Bake at 340 ºF (170 ºC) for 30-35 minutes. Bake at 340 ºF (170 ºC) for 35-40 minutes. Bake at 340 ºF (170 ºC) for 40-45 minutes. 1. My chiffon cake did not rise properly. My chiffon cake sank/deflated after I took it out of the oven. Get chiffon cake pan: Please use an aluminum, 2-piece tube chiffon cake pan. 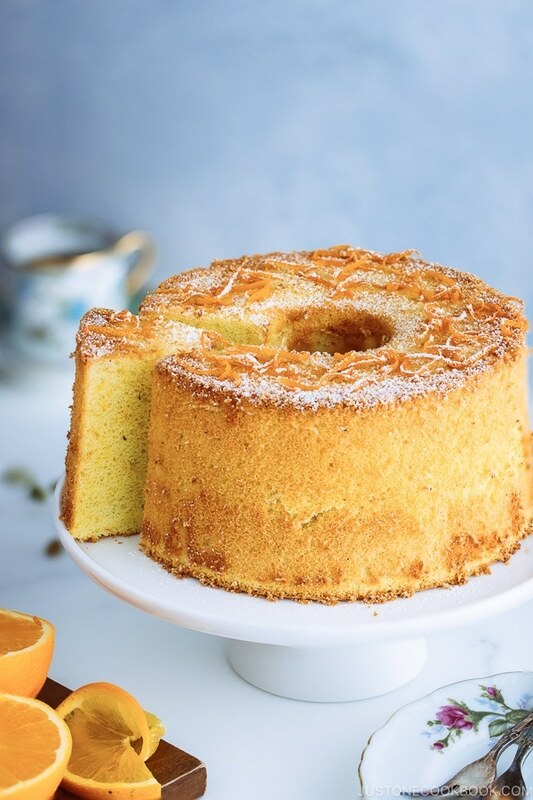 You cannot use a non-stick pan to make chiffon cake as the wall is too slippery for the batter to cling to the sides and center of the chiffon cake pan in order to rise higher. Do not grease: For the same reason, you do not need to grease the cake pan. Invert the cake pan to let cool: If you didn’t use the chiffon cake pan, you can’t do this step. It’s very important to invert the chiffon cake pan while letting it cool so the cake will not collapse and it will continue to stay tall with the help of gravity. Beat egg whites correctly: Under-beating egg whites will cause the cake structure to collapse, while over-beating can cause the mixture to break down when you fold it into the batter, creating a heavy batter. Therefore, always keep an eye out for the egg whites as they thicken. A safe way to do is whip your egg whites on medium speed. And it’s ok to stop frequently to check as you get close to the stiff peak stage. Check oven temperature: When the oven temperature is too low, the cake will not rise to its optimum height. It’s also possible that your oven setting doesn’t display the actual oven temperature. Get an oven thermometer to place it in the oven and test the actual oven temperature at 4 corners and center. My oven has some hot spot in one corner so I know I need to avoid placing my cake there. Increase baking time: If you did everything right, maybe the baking time was not enough. 2. My cake got burnt on the top. Use aluminum foil: Your oven may be a bit too small for this cake pan. You need at least some space between the cake pan top and the oven. To fix this problem, you can cover the cake with an aluminum foil over the top to prevent further browning once the cake reaches a nice golden color. 3. My cake has big holes (air pockets). Mix thoroughly: When you don’t fold the egg whites and batter thoroughly, the cake batter is not consistent. The meringue parts have too much air bubbles than the other parts, which results in large pockets and other parts of the batter cannot sustain the structure. Make sure you mix everything thoroughly without destroying the bubbles. Beat egg whites correctly: When egg whites are under beaten, the small air bubbles cannot sustain as the temperature goes up. As a result, small air bubbles turn into one bigger hole. Prevent air pockets: The air pockets may be created when you pour the batter into the chiffon cake pan. Make sure to pour the cake batter all at once in one location. Also, run the wooden skewer in the batter a few times and gently tap the chiffon cake pan against the kitchen counter to get rid of large air bubbles that are trapped in the cake batter. 4. My cake has white streaks. Mix thoroughly: Those white streaks are meringue (egg whites). It happened when you didn’t incorporate meringue into the batter thoroughly, so the egg whites appeared as white streaks. Q: Can I use all-purpose flour instead of cake flour? 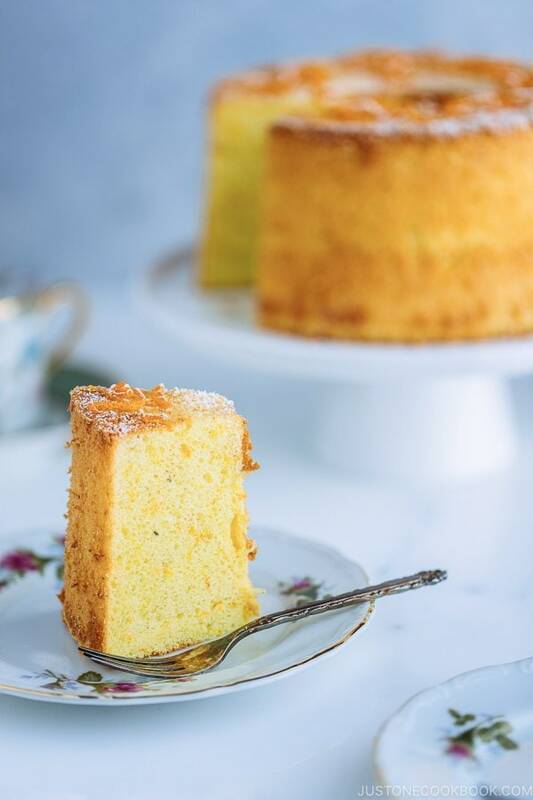 A: If you have enjoyed chiffon cakes in Japan and know how airy, fluffy and soft the chiffon cakes are, you have to bake yours with cake flour to achieve the same texture. You would know the difference immediately if you make it with all-purpose flour. All-purpose flour has a higher protein content, which develops more gluten and results in a tougher cake. The substitution or the easiest workaround for cake flour is to mix all-purpose flour with cornstarch. To make 1 cup cake flour, simply take out 2 Tbsp from 1 cup all-purpose flour and replace it with 2 Tbsp cornstarch. However, in my opinion, store-bought cake flour would give a better result as it has been sifted finely with the machine. Q: Do we need to add baking powder? A: In general, baking powder is not necessary as chiffon cake relies on the egg whites to rise. Baking powder is just a backup. However, chiffon cake recipe includes oil and egg yolks (fats) and baking powder to counteract and helps the cake rise. Q: Can I use melted butter instead of vegetable oil? A: No, to get a light, airy, soft texture, it has to be vegetable oil or canola oil. Please don’t substitute with butter. Q: Can I bake in a regular cake pan or bundt pan? A: I highly recommend getting an aluminum tubed pan that allows the cake to rise taller. Avoid non-stick pan and never grease the pan because the cake will not be able to cling and rise as high. If your chiffon cake pan is not the same size as mine, I always recommend doubling the recipe (instead of trying to divide an egg by weight). Use the leftover batter to make a small cake in a regular ramekin or smaller cake pan (it won’t be a proper chiffon cake though). Q: When does the cake taste best? A: It’s best half day to whole day after baking. Q: How long does the cake last? A: Wrap the cake in a plastic wrap and you can keep at room temperature for about 4-5 days. Depends on the ingredients, it might be better to keep in the refrigerator. You can wrap the individual or whole cake in the freezer, but some flavors will be lost. Defrost naturally and enjoy. Have you tried any fun flavors you would like me to share next? I’d love to hear. 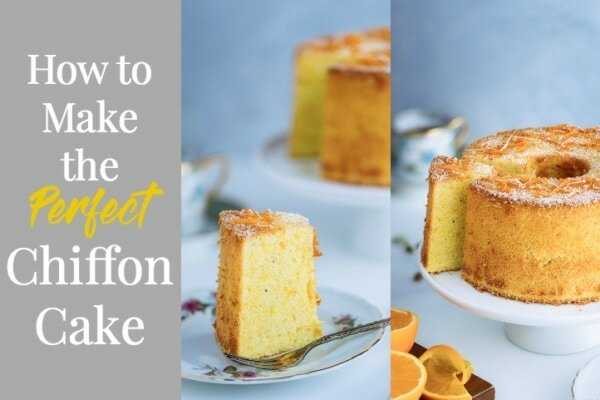 I hope this tutorial guide will help you in your chiffon cake adventures. 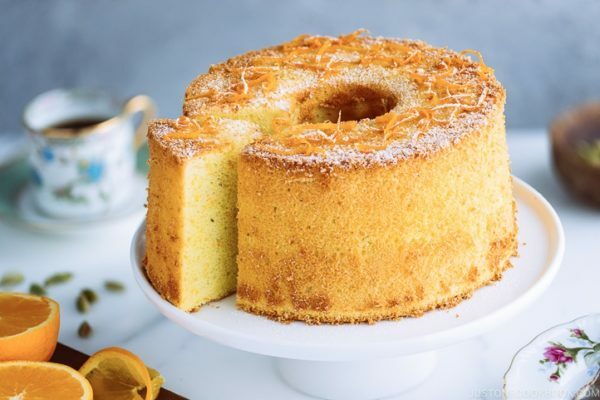 If you baked a chiffon cake and you’re still having troubles, please ask in the comments below. I’ll be happy to help. Do you bake using fan mode or TOP and bottom heat mode? What is the weight of large eggs with shell? Hi Christina! I do have a convection oven, but not everyone owns it, so I use bake mode for all my recipes (mentioned in my FAQ). My baking mode has top and bottom heat. An American large egg without shell is 50-54 grams (sorry I don’t know with shell). I measured the weight myself several times and I get that range. My problem is removing the cake from the pan… always gets jagged edges around. Can you please advise? Rice flour or gluten free baking flour are also great substitutions for cake flour. They don’t have the density (gluten content) that wheat flour does, so the cake comes out super light and fluffy! Hi Tama! Thank you for your input! 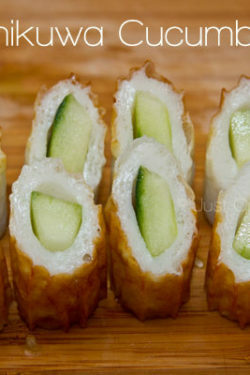 A lot of people make Chiffon Cake with rice flour… I really need to try it one of these days! Thank you for inspiring me! Thank you for all your precious tips Nami. I tried the matcha flavoured one first and it went quite well, not too sweet, and its fluffiness was awesome! And do you think that fruit juice (like apple or pear) can be used to get fruity chiffon cakes? I think pistachio sounds wonderful!!! Pistachio paste must include some oil right? If so… I would be very careful… anything with oil, the consistency will change and there is chemical reaction. I’ve read somewhere that if it’s for chocolate, use cacao powder and try not to use (or limit) chocolate itself for the chiffon… it’s the oil that can be tricky. You probably have to play with the oil amount used in the original recipe. Hi, I am very excited to try your recipes, I just ordered the chiffon cake pan on amazon! I was wondering if I were to make chiffon cupcakes, what would the bake time and temperature be? I am planning on using parchment cupcake liners. Hi Katherine! I hope you enjoy this recipe. I’ve only tried making this cake in the chiffon cake pan, so I’m not sure how long it takes to make the mini cupcake size…. But readers have made this recipe in cupcakes and came out successfully so I think it’ll work. 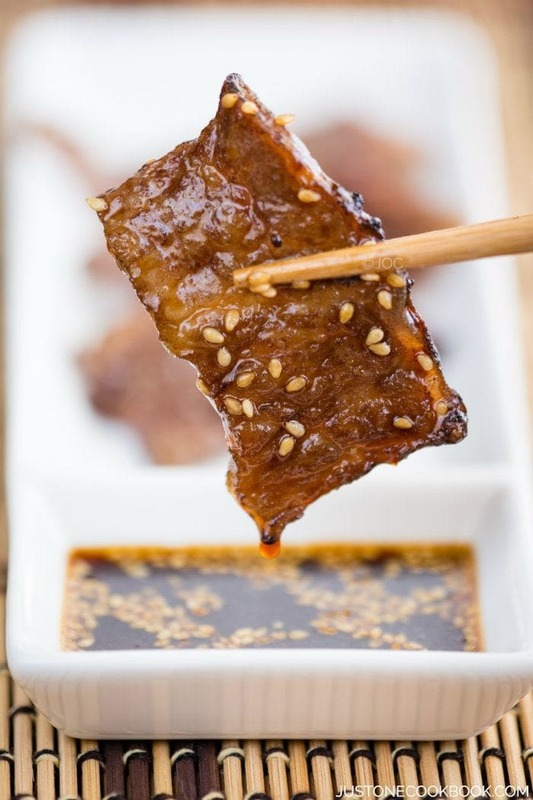 Same temperature but reduce the cooking time until a skewer inserted comes out clean. Where I come from we also use chilled egg whites and no cream of tartar – just egg whites and sugar (or sometimes confectionary sugar), sometimes with a drop of lemon juice in it. I whisk meringue until it is glossy and thick – thick enough to feel the resistance. I find I get this result the best if I whisk over a bath of 70 degrees Celsius. Hi Ida! Ohhh really! Knowing that most of western sweets are from Europe, I believe that this Japanese technique (cold egg whites) come from somewhere in Europe. Are you from an European country? Thank you for your additional tip! Hi Nani! No need for cream of tartar? Hi there! Nope, Japanese don’t use it. 🙂 I mentioned under “3 tips” above in the blog post. Thanks Nami. It came out perfect. Only one thing happened, when I inverted my pan, after a while, the cake fell on its own. hahaha. So funny. Also, why is it for my tube pan- the center is not so baked enough? But for the rest (fat dido tall pan, and 6in pans from Wilton) they came out nicely. Oh no! First thing I want to ask/confirm is that your tube pan was NOT non-stick pan, right? This is very important. Not mixing the batter thoroughly. Air bubbles were not even and didn’t keep the structure and collapse. But then you mentioned that the cake around the tube was not baked enough. That tells me that the oven temperature was probably low or you need to bake a longer time than my recipe says. Each oven is different… even though the oven says the correct temperature, inside oven may not reach to that temperature. It’s really good to check your oven temperature once by putting the thermometer in 4 corners and center. That way you can check if there is any hot spot. It’ll be very helpful to know when you bake. I think in your case, the oven temp was lower OR you simply needed to bake a longer. So the cake was not ready to take out and structure couldn’t keep well because it wasn’t cooked through. Hope that helps? I’m so delighted to tell you that for the 3rd attempt, I’ve succeeded! I wanted to keep it as a souvenir, but I sold it! And now I’ve got 5 orders! Thanks so much, Nami! I failed before because I underbaked them. Thank you this was very informative. Could you please convert the measurements for a 22cm tubed pan? I have made your chiffon cakes a few times and love their texture. I just have one problem, they always slip out of the tin when I am cooling them! I am not sure why as I follow the recipe exactly and use the correct chiffon tin as well. Can you think of any reason why they keep falling out of the tin before its fully cooled? Hi Wendy! Interesting! And when it’s fall out, does it stay the shape or it breaks into apart? I think the structure must be broken inside – either 1) Didn’t bake at the right temperature (it was too low) or you undercook. 2) You didn’t mix the batter thoroughly, so some parts didn’t have good structure. Have you checked your REAL oven temperature? Not the display temperature but the real temp inside the oven. You may want to check it. A lot of people realize it’s not actually getting the right temp and you also find hot spots inside the oven by testing the real temperature with thermometer. It keeps it’s shape. Once its cooled completely I cut it open and everything looks, feels and tastes fine. I haven’t checked the oven temperature as we just bought it last year and haven’t had any issues with baking anything so far, but I do know the back right corner is a hot spot. Hi Connie! I think it sounds like your egg whites were not beaten enough or over-beaten so the batter could not keep the structure. Your tips are very helpful! I’ve been trying to make a chiffon cake (different recipe) and am struggling. The cake is always very flat and at first was dense and rubbery. I decided maybe I was overbeating the eggs so I deliberately stopped sooner this time, but the cake was still flat (although not rubbery). But it has large air holes throughout. Did I go from one extreme to the other? Hi Vanessa! Hmm, hard to know why you have the issue when you’re using someone’s recipe that I am not familiar with (Sorry….). If you’re continuously failing, maybe try other recipes? 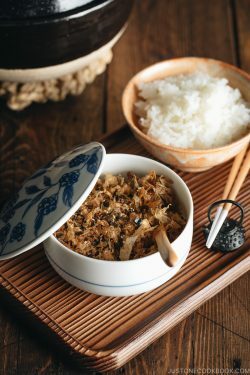 Maybe it may not be your skill, and something important is missing in the recipe you’re trying. Also, your oven temperature may not be optimal. A lot of people don’t notice that because they assume the oven temperature is correct (but inside it’s not the same temperature). I understand, but thank you for replying! I do intend to buy an oven thermometer. How would you go about modifying this recipe for a chocolate chiffon cake? 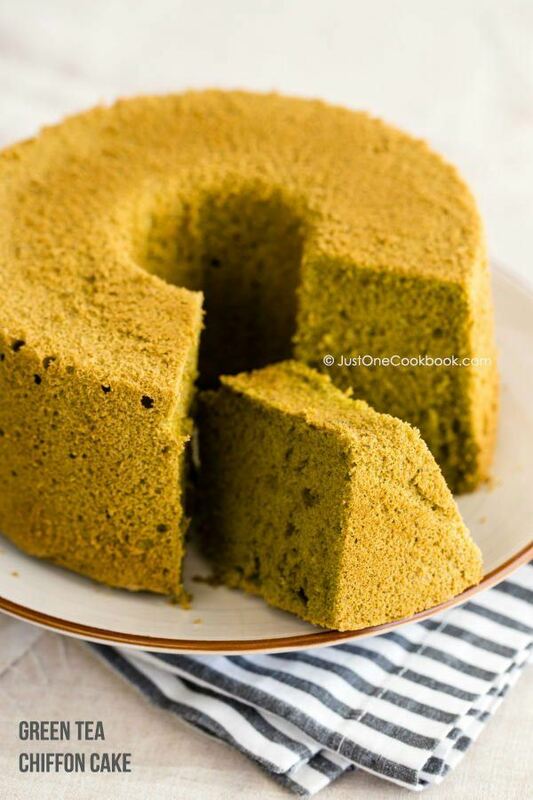 You can replace matcha with cocoa powder in my match chiffon cake? I think a few people have tried it with a successful result and left a comment in the post and on social media. Sorry I haven’t had a chance to make it with chocolate flavor… one day I will! Otherwise, department store kitchen floor is an easy fast choice (6 or 7F floor usually, but slightly expensive for convenience) or TokyuHands. Thank you for responding so quickly and for all of the information!! It looks like she will be staying in Shinjuku! If you have any store recommendations, I’d really appreciate it. Even though I really want the chiffon cake pan from Asai Shoten, I also want my friend to enjoy her stay in Japan to the fullest. Hi Krystine! Great, then I want to suggest her to go to Keio Department Store (it’s building above Shinjuku Station). There is a store called Tomiz at 8th floor. It’s the store that sells baking goods (and all kinds of non-baking ingredients as well), baking mold etc. You can find a chiffon cake pan there. On google map, search “tomiz keio shinjuku” (sorry, the link contains Japanese words, so it looks weird below). I baked a chiffon cake and it turn out to have wet middle. What causes it? Hi Gwen! I would like to suggest to check if the inside is cooked through by inserting a skewer BEFORE taking out the cake from the oven. When it’s cooked through, the skewer comes out clean, but if it’s wet inside, your skewer comes out with wet batter. Everyone’s oven is different, so baking time is just a guide and you always need to check doneness. 🙂 Hope this helps! Hello! I have tried to make Chiffoncake many times now-exactely as you say and exactely by the recipe, but everytime I take it out of the owen it drops down several centimeters. What’s wrong? Hi Annelie! From what you wrote, I think the cake structure has some issue. If the cake is not cooked through and collapse, it could be oven temperature (actual temperature inside) or your oven requires more baking time. If the cake was cooked through, then it’s probably related to the meringue. Over-beaten or under-beaten egg whites can be the reason. Another one is the way you pour the batter into the cake pan. Make sure not to include any air pockets. Try to take each step slowly and completely, so you can scratch out the possible cause. Hope you will get the perfect cake next time! I would like to make a chocolate chiffon cake. How would I go about changing the measurements of the ingredients or should I add 1/2 cup of cacao powder and leave rest of ingredients the same? Hi…my chiffon cskes top portion is very sticky asbin the top part sticks to my hand. Plz advise. Hi Anisha! Did you use different ingredients other than what I specified in the ingredient list? Thanks so much for the recipe! It’s easier to follow because of the US measurements. Anyway I’m kinda confused, everyone says egg whites should be at room temperature, but it’s better if chilled? At what temperature should it be? Hi again Nami sama! Thank you for the reply! I read that if you beat cold egg whites, they won’t whip well (https://whatscookingamerica.net/Eggs/perfectmeringue.htm) But I suppose that isn’t true. I have another question if you don’t mind. I am allergic to any vegetable oil and butter, is it possible to reduce the amount in half or substitute with applesauce if I’m making a chiffon cake? I see, thank you so much again for the explanation! I finally succeeded after my second try. However, i find my cake a little too moist and perhaps even chewy? Do you have any idea why? Hi Ode! Hmm… how moist was it? I would be happy if my cake is moist (but not wet, of course). Also what do you mean by chewy? Do you mean it’s not airy and bouncy at all? If there is a picture, it helps a little to imagine….